Combining digital and print media. Go Braves! Baseball is one my favorite things in life. I played the game as a kid and now have the joy of watching my son grow-up playing the game as well. We also go watch baseball games several times each year including youth, collegiate, and professional levels. Each time we go to the Atlanta Braves games at Turner Field I’m always impressed with the customer focus and game day experience. I’ve previously written about the customer focus of the employees at Turner Field. On my last trip, I took notice of how they combine the use of digital and print media to both drive sales as well as educate their customers. I am a big proponent of printing web addresses without the ‘www’ because it shortens the print, makes it simpler to read, and draws more attention to the brand name. We come to a point now where when people see something like brandname.com they understand its an Internet address because of the .com suffix. Make sure your web site will work with and without the ‘www’ prefix on the address. OK, so creating customer segments is from marketing 101. The job now is to create separate and distinct landing pages for each segment such as brandname.com/segment1. Doing this allows you to not only design a custom message for the target segment but to uniquely track the site usage through web analytics software. Designing landing pages is an Internet marketing topic unto itself. The basic principal is to make sure the call to action is clear and distinguishable. Don’t clutter the page with multiple options and distractions for your customer. Help them get to where you want them to be! For the Braves they have created segments based on life events of their customers, baseball events with players, community service, etc. They are reaching people that want to watch baseball for the game as well as those that use baseball as more of a social event. Multi-channel marketing offers the target segment more than one way to interact with a brand. Certainly there are strategic considerations about how to message the target audience such as advertising in a single channel or multiple channels. 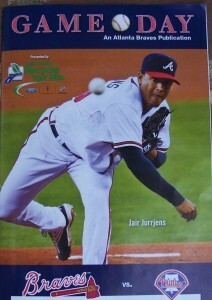 The Braves are using the stadium, a printed brochure, and a web site to present messages to their fans. In addition to this, throughout the stadium and during the game, almost every written and audible advertisement has URLs with targeted landing pages. The messaging is clear and follows a consistent pattern of pointing customers to braves.com/keyword for information and ordering. Modern eCommerce sites always offer cross sell and upsell items for existing visit. But how do those brands promote future visits during your current session? The Braves use your current visit to show you things you could do on your next visit. Are you having a birthday? (we all do right? )You can get a free Braves ticket. Do you want to get on the field and watch the pros take batting practice? Do that by planning your next trip in advance and purchasing the extra ticket. Are you looking for seats with all-you-can eat food? Tickets for this type of experience are available for your next visit. What’s your experience with marketing of professional sports as they compete for your entertainment dollar. Are there other lessons to be learned from this industry? « Social Media Experts? Your Employees!